LeBron James can do everything; that doesn't mean he should. When the going got rough Tuesday, the Heat stagnated on offense and got into one-on-one play that doesn't fit the NBA Finals. James is a singular player, but he operates best when four guys around him do things. That didn't happen in the second half of Game 1. Miami had 14 assists and a 54-47 lead in the first half but six assists in the second, when the Thunder held a 58-40 advantage. The Thunder defense is long enough and athletic enough to handle good ball movement, but they can really dominate when opponents fall into predictable lulls. They didn't even need to block shots or force turnovers; the Heat shot 6-for-18 in the third quarter, when the Thunder forcibly took control of the game. 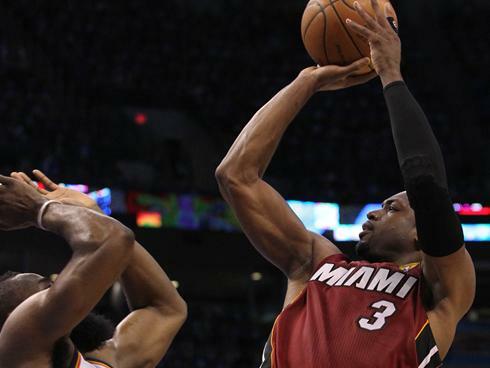 These trends become particularly problematic for Miami when Dwyane Wade isn't playing well. He's on an extended cold streak, so the ball often ends up in James' hands. That's what the Heat want, but they need James to intiate the offense, not his own. Better off-ball movement, including screens, is necessary, or Alonzo Mourning and Pat Riley will never smile again. One of the biggest issues for the Heat since assembling their All-Star triumvirate of James, Wade and forward Chris Bosh has been finding players to knock down shots on the perimeter. Shane Battier made five of six shots, including three three-pointers, for 13 points in the first half, then added four on 1-for-2 shooting in the second. Point guard Mario Chalmers had 10 of his 12 points in the first half, as well. Mike Miller, the Heat's best shooter, finished 1-for-2 for the game. "(Wade) had a couple opportunities in the fourth quarter in the paint that he wasn't able to convert," Heat coach Erik Spoelstra said. "He was aggressive in that quarter. We'll continue to get him into places to be aggressive." 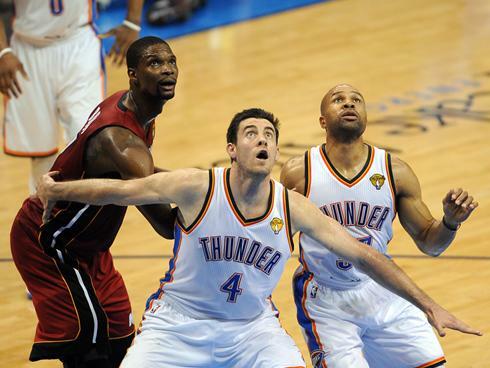 But Miami may be better off focusing on keeping its supporting cast involved. 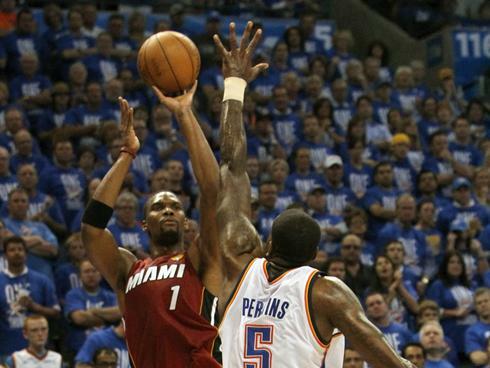 The Thunder drove right past or shot right over the Heat. (Sometimes, both.) With Wade's poor play and Bosh's recent injury, Kevin Durant and Russell Westbrook are two of the three best players in this series. Miami couldn't figure out how to defend them at all in the second half. 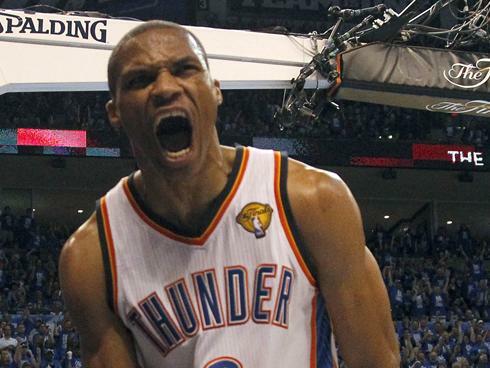 Switching on screens is a bad idea against the Thunder because Westbrook can get by anyone. 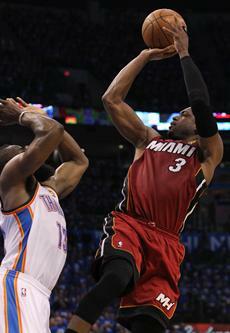 He embarrassed Wade several times in the third quarter with his speed and ever-improving jump shot. So James was tasked with defending the point guard in the fourth quarter, but that left Battier on Durant, another bad matchup for the Heat. The solution may be to continue those matchups but force a physical style, preventing Durant from jumping over Battier or Westbrook from blowing by Wade. James is good enough to guard anyone, but Spoelstra only has one of him. 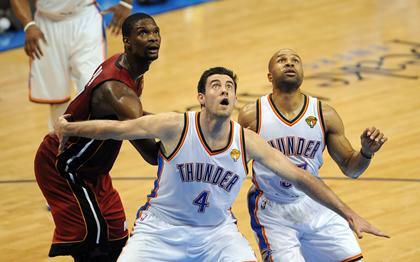 Nick Collison was a revelation, but his role might be temporary. The Thunder reserve played nearly the entire fourth quarter while fellow big men Serge Ibaka and Kendrick Perkins sat, and his defense and rebounding were instrumental in holding off Miami. But coach Scott Brooks has a pattern of switching up how he uses his eight-man rotation. 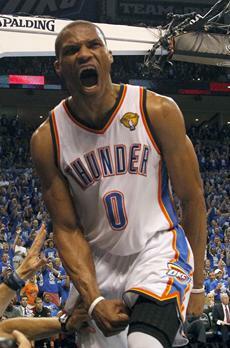 In Game 3 of the Western Conference finals, he set free Thabo Sefolosha. Sefolosha wreaked havoc on both ends of the court, shutting down San Antonio Spurs point guard Tony Parker and scoring 19 points in 37 minutes to lift Oklahoma City to its first win in the series. But Sefolosha played 22 minutes in each of the next to games. Bosh's benching wasn't the issue for the Heat. 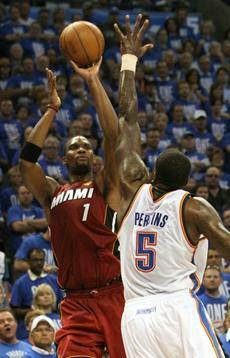 Miami played its best basketball in the first quarter, when Bosh was on the bench for seven minutes. And the forward failed Miami in the second half, making one of five shots from the field and grabbing only two rebounds in 18 minutes. If Spoelstra opts to move Bosh back into the starting lineup for the first time since he strained an abdominal muscle on May 13, it should be because Bosh is a better player than Battier, even though he didn't show it in Game 1.